Home » News » Harrisburg School District asks 65 teachers to take pay cut, pay back wages in grievance settlement. Harrisburg School District asks 65 teachers to take pay cut, pay back wages in grievance settlement. HEA union leaders address the grievance settlement proposal from the Harrisburg School District. The Harrisburg School District made a big accounting error when it offered dozens of teachers inflated salaries in 2016, and administrators are now asking them to pay for it. Two years after it violated a collective bargaining agreement by hiring 65 teachers at the wrong salary level, the school district is asking them to take a pay cut and give back the wages they were overpaid. The recouped wages would total almost $500,000, with individual teachers accountable for amounts ranging from $600 to $12,000, according to Harrisburg Education Association leaders. 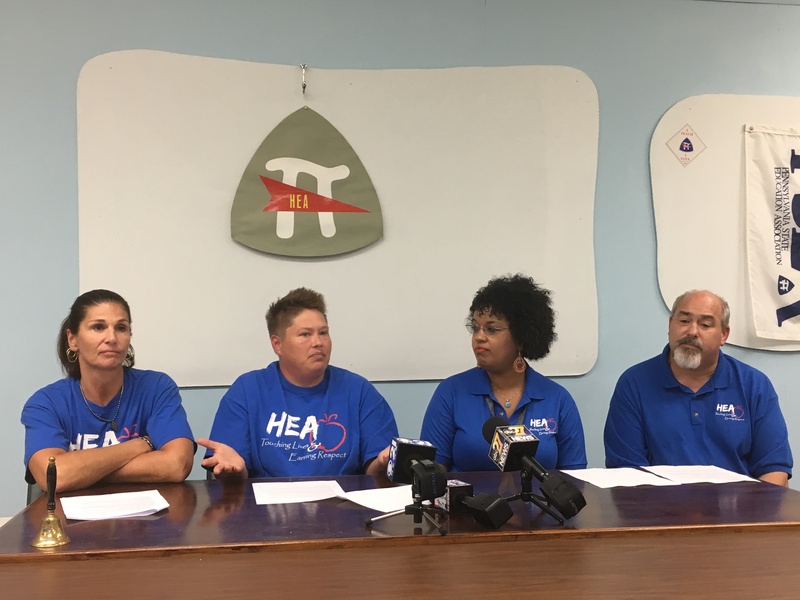 HEA says the offer violates the contracts of the teachers being asked to take a pay cut and insults 79 longtime teachers who are currently being underpaid. They fear it will lead more teachers to resign from the district. HEA uses a pay schedule to determine salary levels for employees based on experience. Teachers who remain employed with the district will advance up “steps” on the salary schedule as they accrue years of experience. However, an ongoing pay freeze has prevented some teachers from moving up in the salary schedule. Under a collective bargaining agreement that went into effect in June 2016, any new district employee must be placed on the same salary step as existing HEA employees with the same level of experience. But when the district hired teachers amid an aggressive recruitment effort in 2016, the new hires were put on the pay schedule based on total years they’d worked in the industry, not at the steps occupied by similarly experienced HEA counterparts. An employment contract shared with TheBurg shows that one employee, an ESL program specialist at Rowland School, was offered a $77,792 salary starting in August 2016. According to salary data the TheBurg obtained via Right to Know, teachers who were hired at a $77,792 salary in 2016 are making as much as teachers who have served in the district for 20 years. Some of the highest-paid teachers in the district – those making almost $80,000 – have worked in the district for less than a year. Meanwhile, a teacher who has served four years in the district – the median length of service – makes between $52,000 and $56,000. HEA filed a grievance against the district in 2016, asking administrators to either reduce the new teacher salaries or promote HEA teachers who had been frozen on the salary schedule. They put forth a $320,000 proposal to bring 79 underpaid employees up to their rightful pay grade, Barksdale said. Now, the district is fulfilling one of their requests. They’ll cut the new salaries to match HEA pay levels, but they want the teachers they overpaid to give back their wages. The proposal would bring in half-a-million dollars for the district, even though administrators set aside $1.9 million for the grievance settlement in the 2018-19 budget that was approved by the board in June. Barksdale said that HEA wants underpaid teachers to be brought up to step instead. She also said the whole fiasco could have been avoided if the district’s Human Resources Department had worked with them in 2016. A visibly frustrated Barksdale said that the district’s administration is driving away talented teachers and hurting children. “The only way this district will move forward is if the district sits down and has honest, transparent conversations with us,” Barksdale said. She said that 90 teachers resigned from the district during the 2017-18 school year and 30 more have resigned this summer. What’s more, Barksdale worries that reneging on 65 salary offers will open the district to costly legal fights. Barksdale said that neither the district administration nor the school board has shown leadership ability. But when asked if the Pennsylvania Department of Education should appoint a receiver, she took a long pause. Previous Post Harrisburg School Board must reconsider action on former business manager, judge says.